With over 30 libraries on UW-Madison’s campus, you could spend most of a semester testing out new places to study. However, many would agree that you would be doing it wrong if you did not incorporate some of Madison’s unconventional study spots into your schedule. Some days, you wake up ready to plow through all your work without any distractions. Most days, people need to be in the “right environment” to study. This differs on the person. Need somewhere with a serious environment that will force you to study? Check out UW’s Historical Society, right across from Memorial Union. There is no talking or phones aloud, and the echos off the marble walls will force you to be super self conscious of your squeaky shoes when you go to the bathroom. You are literally forced to stay in your chair and study. Plus, the breath-taking design of the building is great for a study break Instagram. 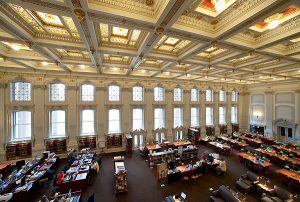 Another great study spot for a less serious day is the Wisconsin Institute for Discovery. While it’s somewhat of a hike, the long trip will ensure that you’ll force yourself to sit there for a while and try to get work done. There are comfortable chairs and couches and plants everywhere to ensure a relaxing space while you catch up on some reading. There’s a coffee shop and bar if you need a break, and the somewhat-busy environment promises no one will give you a strange look if you take a break to watch some Jimmy Fallon clips.